A look back at The Nation‘s coverage of the Republican governor’s shocking rise and possible premature fall in national politics. From the moment she rose to national prominence, Sarah Palin has been a polarizing , yet formidable political figure. She has managed to merge qualities of Nixon, Reagan and George W. Bush into a style uniquely her own. While she may not have won over the nation-at-large, her fan base is undeniably fervent. As she prepares to exit as governor of Alaska, here is a look back at The Nation‘s coverage of this fascinating political figure. Sarah Palin, the youngest and first woman to serve as governor of Alaska, enjoys huge approval numbers–but something is rotten in Juneau. Her short tenure is already clouded by ethics investigations, the most prominent of which involves the firing of a state trooper ostensibly because of a personal grudge. These local scandals coupled with her lack of experience (she was elected to her first term in 2006) are deemed by most pundits as sufficient to rule her out as a potential national candidate. 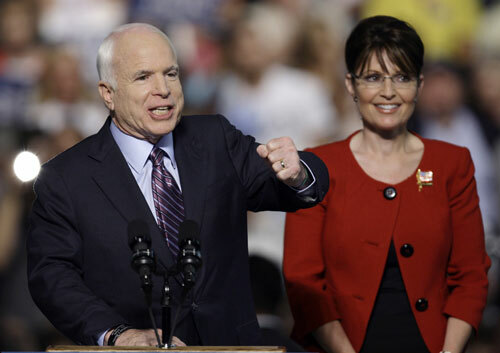 However, in a move to shake up his campaign and to woo disgruntled Hillary Clinton supporters, Republican presidential nominee John McCain selects Palin as his vice presidential running mate on August 29, 2008. Branding themselves a team of “mavericks” the unlikely ticket is deemed both bold and risky at a time of war and economic collapse. 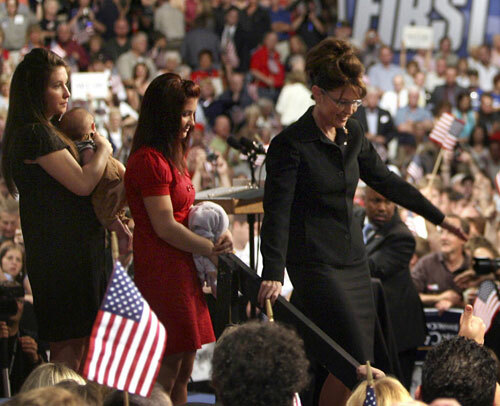 Almost as soon as Palin arrives on the national scene her personal family drama takes center stage as well. Most Americans quickly learn of her decision to give birth to a child with Down Syndrome but few expect the revelation that Palin’s eldest teenage daughter Bristol was about to give birth herself. Due to the family’s strict anti-abortion views Palin’s daughter commits to not only having the child but marrying its high school-age father, which only leads to more controversy over the ensuing months. 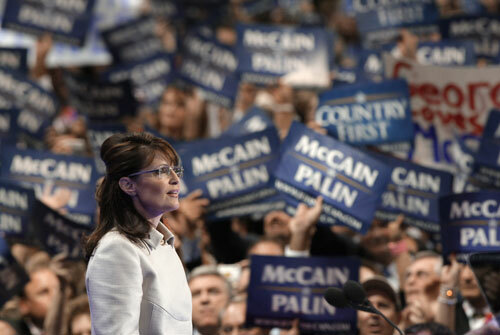 In a harsh, confrontational speech aimed at both her critics and Democratic presidential nominee Barack Obama, Palin electrifies the crowd at the Republican National Convention in St. Paul, Minnesota on September 3, 2008. While she is undoubtedly an overnight political star, her defensive posture ends up raising more questions than it answers. The warm reception Palin receives at the RNC brings a brief surge of optimism among Republicans who polls showed are largely underwhelmed with the McCain campaign to date. Palin’s popularity seems to rival that of Obama once again raising questions about the phenomenon of celebrity candidates. 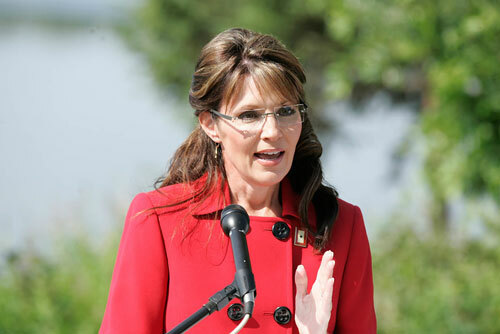 The angry rhetoric and violent overtones at some of the rallies headlined by Palin begins to cause a stir. Playing the role of attack dog, Palin casually links Obama to terrorists and suggests that some parts of the country were more “pro- America” than others. 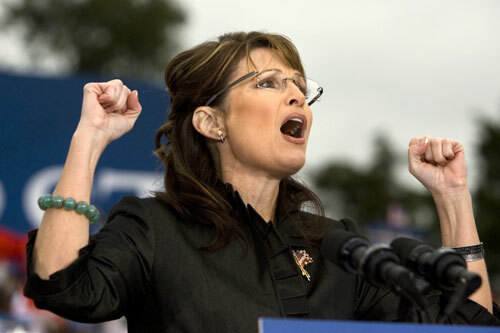 Meanwhile, pressure grows on Palin to provide more specifics about herself and her record. 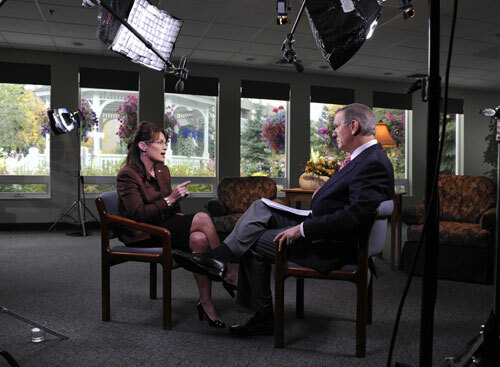 After much stalling, Palin finally begins sitting down for one-on-one televised interviews. Her first, with ABC’s Charlie Gibson (pictured here) is shaky at best, but no one could have anticipated her deer-in-the-headlights performance opposite Katie Couric. In their now infamous exchanges Palin appeared clueless on the economy and foreign policy, further convincing American voters of her inability to fill the role of vice president. 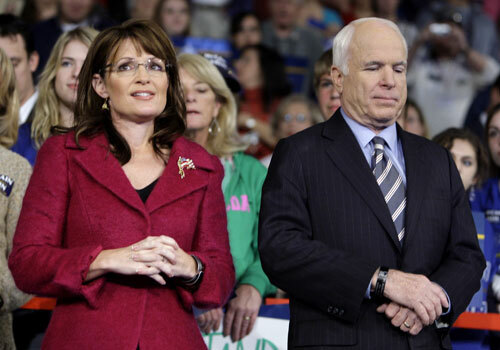 After weeks of bad press and poor performances more Americans tune in for Palin’s first and only vice presidential debate than watched Obama and McCain’s first showdown. While some say she more than held her own against Democrat Joe Biden, her lack of knowledge about the role of the vice president among other glaring gaffes doesn’t help burnish her credentials with undecideds. 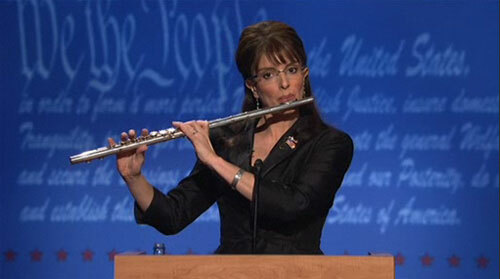 Adding to Palin’s woes is the fact that week after week, brilliant Saturday Night Live veteran Tina Fey is mercilessly and effectively parodying her–often by simply recreating Palin’s somewhat perplexing speech patterns word-for-word. An attempt by Palin herself to defuse the jokes by appearing on SNL did little to help her image though it may have helped inspire recent talk of her talk show aspirations. Reports of tension between John McCain and Sarah Palin begin leaking out during the final days leading up to Election Day. 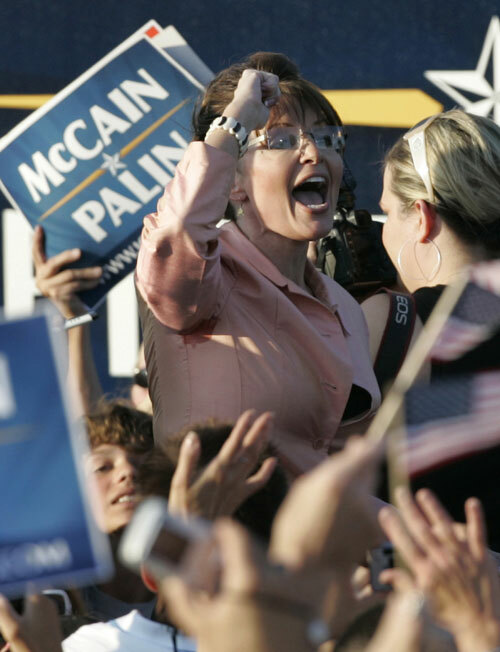 Palin’s allies claim she has been mismanaged and stifled by the McCain campaign, while the Republican senator’s advisers suggest Palin is an arrogant loose cannon. After McCain/Palin lose decisively to the Obama/Biden ticket, many observers suggest that the Alaska governor’s performance played a serious role in McCain’s defeat. Nevertheless Palin is eager to burnish her 2012 credentials. Upon returning to Alaska she shuns stimulus money for her state while battling yet more ethics allegations and attacks from former McCain campaign staffers. 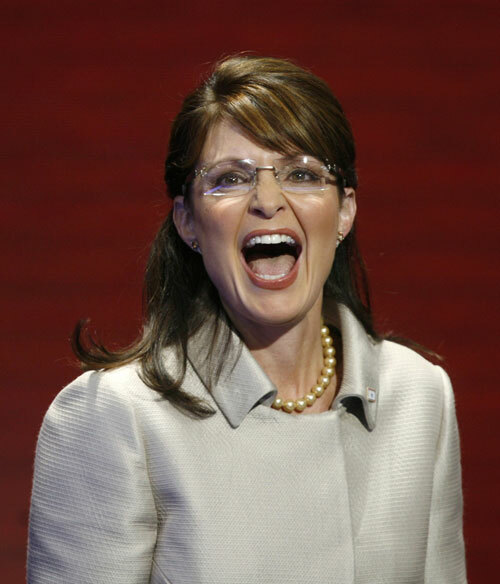 On July 3, 2009, in a rambling and not altogether rational speech, Sarah Palin announces that she plans to resign as governor of Alaska with about a year and half left to go in her first term. Citing dead fish, the role of a point guard and a desire to effect change from outside of government, something tells us we aren’t seeing the last of Palin. Estranged son-in-law Levi Johnston is a consistent thorn in the side of the Palin camp. 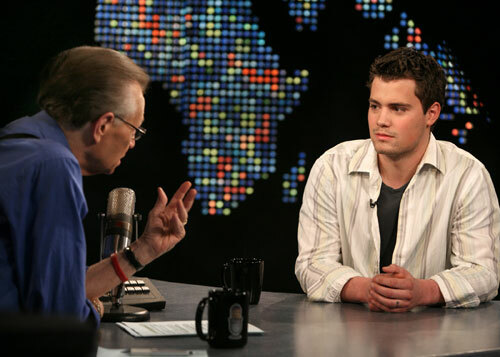 In ubiquitous media appearances on talk shows like Larry King Live (with an upcoming pictorial in Playgirl), Johnston has been eager to spill Palin family secrets and discredit the former governor. 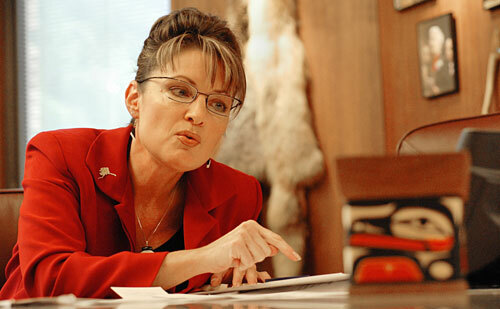 Palin attempts to meddle in the 2009 regional elections and largely comes up empty handed. After getting rebuffed by GOP candidates in New Jersey and Virginia, Palin throws her weight behind ultra-conservative Doug Hoffman in the NY-23 congressional race (forcing the more moderate Dede Scozzafava out of the race). 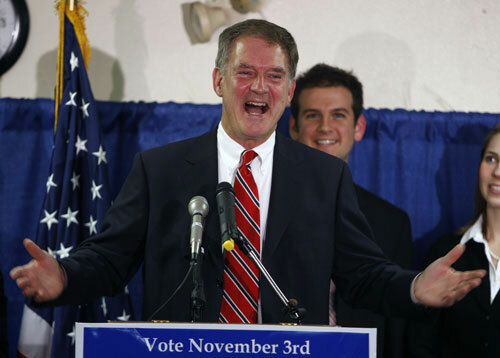 But Democrat Bill Owens (pictured) emerges triumphant on Election Day.